This illustration is from the front page of the D1-2 module compilation and is drawn by Bill Willingham. Like most of Willingham's work, it's obviously influenced by comics art from the time. Indeed, if you look carefully at this piece, you'll see it's more than influenced by comics art. Regular readers of the Acaeum probably already know this one, but there are three mighty Marvel Easter eggs hidden within this picture, which are really obvious once you know they're there, but I admit I never noticed them for years. I love Bill Willingham's work and I've always loved Marvel comics, but I've never noticed that before in this illustration. Yeah, the Acaeum had a thread devoted to it at one time, and it's still mentioned in passing every so often. It's a great early example of a D&D/AD&D Easter Egg, especially for us Marvel Zombies. Okay, I'll bite -- what are they? If you found the Spider-Man face, you're very close to the other two. D'oh! Very clever! It almost begs for a clever DM to come up with some crazy story as to why such items would be in a treasure trove. There's a similar easter egg in the art of one of the Monster & Treasure Assortments: Magneto's helmet. I have never noticed those before, love his work too. Awesome. Had never noticed that before. I love Willingham -- both his art and his writing, e.g., Fables. I must admit I actually always found the spider-face kind of distracting in this picture. But the other two I never noticed -- just now I was like whu-HUHH!? Nice catch! The symbols on the drow skirts, particularly the third one (l-r) look a bit like an inverted version of Doctor Strange's chest symbol, but I'm probably reaching there. The lack of a Mjolnir in there is a bit disappointing though! 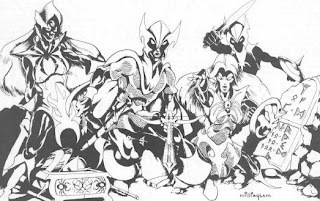 Jeff Dee's D&D art is also channelling some John Byrne, I've always thought. Oh! Oh! I see it! Jeff Dee did a lot of the art for Villains and Vigilantes, the almost unplayable Superhero game, so thta where that may come from. On the same note, I'm pretty sure that my life long love of Marvel, especially the silver age, has influenced my games almost as much as Tolkien or RE Howard. That pop culture sense of drama, adventure, and mystery in old school Marvel was easily translated into game terms. It's appropriate that a lot of that old schoo art had a comic book feel. @Rach's reflections: not Magneto's helm...this particular version of this hero's helm is probably throwing you off a little. It has gone thru various design changes thru the years. You'll get it...keep looking. When you do, you'll see that it stands out in somewhat stark contrast to the rest of the pic. Wow, there's a much stronger connection to Marvel than I imagined! James, might you do a post on the Marvel RPG that TSR rolled out in the 80s? Had any experience with that? I grew up reading X-Men from the mid-70's to mid-80's, back when they where at their most dynamic. I remember how the characters felt vary human, and how they delve into old-school science fantasy. It was that sort of genre blending, that was a big influence in my games. I always like that pic because it made the Drow look like Nightcrawler, as they use to draw his face in such a shadowy way. He has the appearance of a demon, but he was in fact the most human character in comic history, and he is much beloved for that. For a lot of D&D fans, they see Drizzt as the Drow's capacity for good, but to me, it was seeing Kurt Wagner in their faces. Thanks for sharing that pic! Had any experience with that? Lots. It was the only superhero RPG I ever played with any regularity, because I found Champions much too daunting and Villains & Vigilantes too silly (since you played yourself as a superhero). Holy crap in a coif, it IS Iron Man's. Hey, does anyone know what the runes on the tablet say? I'm pretty sure the runes don't say anything intelligible. I remember taking the time to decipher them once and they're full of nonsense words.